March 3, 2009 May 26, 2012 Thomas Pluck Music80s, Gay, Klaus Nomi, Music, The Nomi Song, Venture Bros. He was a unique performer in a time when we were still experimenting with radical revision of nostalgia, and really was part of the ’80s zeitgeist of uber kitsch, wacky ’50s sci-fi adoration, and plastic fetishism. Just look at that tuxedo. Musically he was one of the best things out of Germany at the time- up there with Falco, Neu!, Kraftwerk. Sadly his time was short; as you can imagine a skinny angular man of radical fashion sense with a falsetto- he was gay and one of the first casualties of AIDS, when no one even knew what it was. It’s a shame we lost him early, as he had just signed on to the inevitable heinous music contract with RCA, and was getting exposure. Unfortunately they backed him with a new sterile band that lost much of the raw energy and spontaneity of his old group, so we never got to see him claw his way out of record company hell and make good again. If his music intrigues you, you should check out The Nomi Song. The doc does get a VH1 feel at times, but it is loaded with archive footage not only of Nomi and pals, but of a lost New York from the late ’70s and early ’80s, when experimental art and music were thriving in the ungentrified crumbling neighborhoods. One of the most memorable moments, when Klaus & co. opened for Twisted Sister in New Jersey, and they all thought the audience was going to kill them. 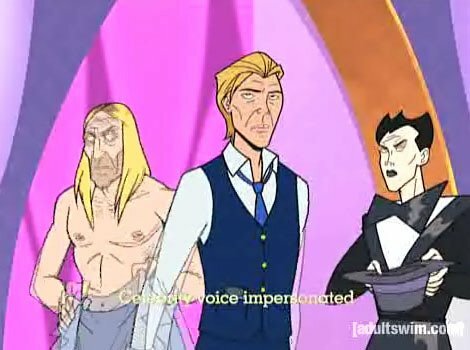 Iggy Pop, David Bowie & Klaus on the Venture Bros. It is available on DVD and Netflix (including instant streaming) so there’s no excuse. 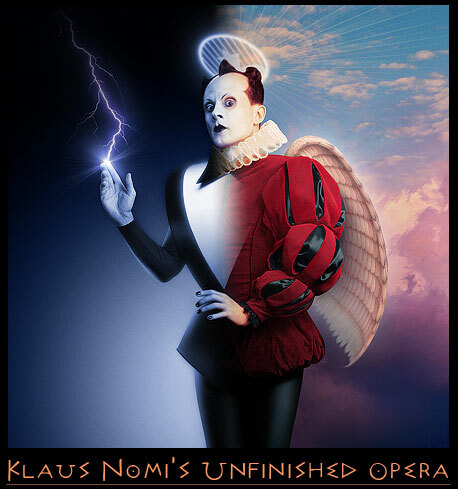 Any aficionado of the ’80s owes it to themselves to give Klaus Nomi a try. So no one can say you don’t Nomi.